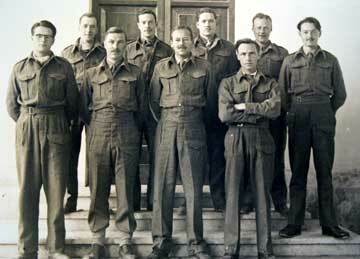 1st Battalion officers taken in April 1943 at Campo Concentramento PG21, Chieti near Pescara, Italy. Back row, left to right, Lieutenants Donald, Roberts, Bath, Mills, and Charles Wingrove. Front row, left to right, Lieutenant Tryalen, Captain Hawkins, Major Hallam and Captain Henning. All were captured in the retreat to Alamein in the June/July of 1942. 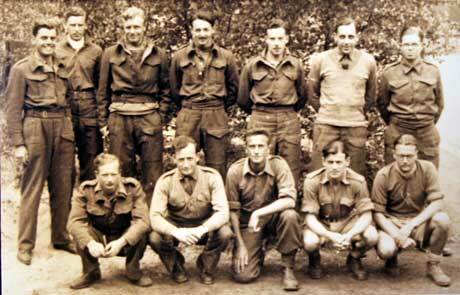 1st Battalion officers taken in May 1944 at OFLAG 79 (Late VIII F) Brunswick, Querum, Germany. Back row, left to right, Lieutenants Constable and Mitchell, Captain Hands, Lieutenants Charles Wingrove, Roberts, Harvey and King. Front row, left to right, Captain McKenzie (Adjutant), Lieutenant (Quartermaster) Spiers, Major William Tilly, and Lieutenants Horne and Griffin. Lieutenants Wingrove and Roberts were captured in the Western Desert in June 1942, the remainder were taken prisoner on the Greek island of Leros in November 1943. 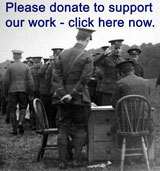 List of repatriated King’s Own Royal Regiment prisoners of war from the European theatre of war. This including men captured in France and Belgium, North Africa and the Western Desert, Leros, Italy and Germany.